In a recent TV ad, a group of office workers give their boss a holiday gift of automobile floor mats. He seems overjoyed. But are employees supposed to give presents to their supervisor? Car mats may be okay; cars a definite no-no. 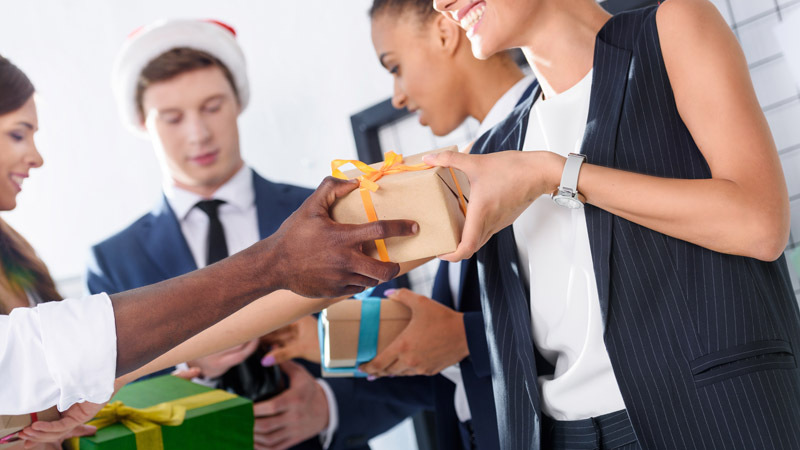 “Gift-giving should be an authentic expression of kindness, without expecting reciprocity or currying favor,” writes HR expert Terry Petracca in Mel Magazine. Some organizations specifically prohibit employees from giving gifts to their managers to prevent claims of favoritism or jealousy. “And in today’s environment concerning allegations of sexual impropriety, I suspect more companies will be adopting this type of policy to eliminate any perception of preferential treatment, bribery or coercion,” Petracca says. Be sensitive to the reason and the season: Gift-giving is personal, and it’ll be very awkward if you discover that this person celebrates a different religious holiday or none at all. Be thoughtful: Personalize the present so that it it’s more than a perfunctory choice. Examples of office gifts that are appropriate and thoughtful include coffee mugs with clever sayings that reflect the recipient (stay away, however, from risqué quotes or double entendres); books that reflect the boss’ hobbies or interests; and movie tickets for an upcoming film that everyone has been talking about. Stay away from clothing (too personal); coffee gift cards (too boring); or salacious board games (Cards Against Humanity). As a final alternative Petracca suggests a contribution to the boss’s favorite charity in his or her name. TechRepublic’s Teena Maddox surveyed a number of HR and tech executives to determine where they stand on the gift-giving, gift-receiving dilemma. She suggests checking the company handbook or asking HR if giving a gift to a boss is allowed. In some companies, it is prohibited. In any case, employees are never obligated to give a gift to a superior. “It’s more likely that your boss should feel obligated to give you a gift, not vice-versa,” Maddox says. How Much Should You Spend on a Gift for the Boss? How much to spend is a delicate question. “If you spend too much, you’ll risk offending your co-workers who will likely think you’re trying to gain favor. Remember, lavish gifts are never acceptable in the office,” she warns. “The best gifts are something that speaks to your boss’s interests. Ideas include a jersey or hat of a favorite sports team, a donation to a charity your boss cares about, a nice mug with a gourmet tea for the tea drinker, or a box of fine chocolates,” Arden Clise, president of Clise Etiquette, told Maddox. “Avoid gag gifts because the risk is too high that you might offend. Also do not give a personal item such as cologne or clothes. Even flowers can be perceived as overly personal, unless it’s meant to be an arrangement for their holiday table,” Clise advises. If your co-workers decide to give the boss a group gift, you should chip in even if you are against the idea. Not being a part of such a collaboration does not reflect well on your part. “If this is typically how your department handles gifting the boss, the best thing is to follow their lead and contribute however much you’re comfortable giving,” Maddox says. In most offices, $20 per person is considered generous, and $5 or $10 per person is quite acceptable for a group gift, she says. Rather a white elephant gift exchange among the staff and supervisors answers a lot of problems. No one receives a gift specifically for that person and the participants can swap gifts; Also, no one can spend more than a prescribed amount. And, as the name implies, you can regift something you received from a friend or relative even a few years ago. One final note: Most offices celebrate the holidays without focusing on a particular religion, so don’t feel obligated to give a gift particular to the holiday, whether Christmas, Hanukkah or Kwanzaa. previous Automated Interviewing: Should Organizations Use It?